When two vehicles approach or enter an intersection from different highways at approximately the same time, the driver of the vehicle on the left shall yield the right‑of‑way to the vehicle on the right. The driver of a vehicle intending to turn to the left within an intersection or into an alley, private road, or driveway shall yield the right‑of‑way to any vehicle approaching from the opposite direction which is within the intersection or so close as to constitute an immediate hazard. The driver of any vehicle approaching but not having entered a traffic circle shall yield the right‑of‑way to a vehicle already within such traffic circle. In North Carolina a person who commits the offense of failure to yield while approaching or entering an intersection, turning at a stop or yield sign, entering a roadway, upon the approach of an emergency vehicle, or at highway construction or maintenance and if there is serious bodily injury but no death resulting from the violation, the violator will be fined five hundred dollars ($500.00) and the violator's drivers license or commercial drivers license will be suspended for 90 days. In North Carolina it is illegal for any parent or legal guardian of a child less than eight years of age to permit that person to operate an all‑terrain vehicle. Location of television, computer, or video players, monitors, and screens. In North Carolina nobody shall drive any motor vehicle upon a public street or highway or public vehicular area while viewing any television, computer, or video player which is located in the motor vehicle at any point forward of the back of the driver's seat, and which is visible to the driver while operating the motor vehicle. 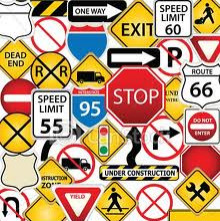 This section does not apply to the use of global positioning systems (GPS); turn‑by‑turn navigation displays or similar navigation devices; factory‑installed or aftermarket GPS or wireless communications devices used to transmit or receive data as part of a digital dispatch system; equipment that displays audio system information, functions, or controls, or weather, traffic, and safety information; vehicle safety or equipment information; or image displays that enhance the driver's view in any direction, inside or outside of the vehicle. The provisions of this section shall not apply to law enforcement or emergency personnel while in the performance of their official duties, or to the operator of a vehicle that is lawfully parked or stopped. The Board of Transportation or local authorities within their respective jurisdictions may, by ordinance, set speed limits lower than those designated in G.S. 20‑141 for areas adjacent to or near a public, private or parochial school. Limits set pursuant to this section shall become effective when signs are erected giving notice of the school zone, the authorized speed limit, and the days and hours when the lower limit is effective, or by erecting signs giving notice of the school zone, the authorized speed limit and which indicate the days and hours the lower limit is effective by an electronic flasher operated with a time clock. Limits set pursuant to this section may be enforced only on days when school is in session, and no speed limit below 20 miles per hour may be set under the authority of this section. A person who drives a motor vehicle in a school zone at a speed greater than the speed limit set and posted under this section is responsible for an infraction and is required to pay a penalty of two hundred fifty dollars ($250.00). Parking in front of private driveway, fire hydrant, fire station, intersection of curb lines or fire lane. No person shall park a vehicle or permit it to stand, whether attended or unattended, upon a highway in front of a private driveway or within 15 feet in either direction of a fire hydrant or the entrance to a fire station, nor within 25 feet from the intersection of curb lines or if none, then within 15 feet of the intersection of property lines at an intersection of highways; provided, that local authorities may by ordinance decrease the distance within which a vehicle may park in either direction of a fire hydrant. No person shall park a vehicle or permit it to stand, whether attended or unattended, upon any public vehicular area, street, highway or roadway in any area designated as a fire lane. This prohibition includes designated fire lanes in shopping center or mall parking lots and all other public vehicular areas. Provided, however, persons loading or unloading supplies or merchandise may park temporarily in a fire lane located in a shopping center or mall parking lot as long as the vehicle is not left unattended. In North Carolina bicycle racing on the highways is prohibited except as authorized in this section. Bicycle racing on a highway shall not be illegal when a racing event has been approved by State or local authorities on any highway under their respective jurisdictions. Approval of bicycle highway racing events shall be granted only under conditions which assure reasonable safety for all race participants, spectators and other highway users, and which prevent unreasonable interference with traffic flow which would seriously inconvenience other highway users. By agreement with the approving authority, participants in an approved bicycle highway racing event may be exempted from compliance with any traffic laws otherwise applicable thereto, provided that traffic control is adequate to assure the safety of all highway users. The passenger of any vehicle who knows or reasonably should know that the vehicle in which he or she is a passenger is involved in an accident or collision shall not willfully leave the scene of the accident by acting as the driver of a vehicle involved in the accident until a law enforcement officer completes the investigation of the accident or collision or authorizes the passenger to leave, unless remaining at the scene places the passenger or others at significant risk of injury. Prior to the completion of the investigation of the accident by a law enforcement officer, or the consent of the officer to leave, the passenger may not facilitate, allow, or agree to the removal of the vehicle from the scene, for any purpose other than to call for a law enforcement officer, to call for medical assistance or medical treatment as set forth in subsection of this section, or to remove oneself or others from a significant risk of injury. If the passenger does leave the scene of an accident by driving a vehicle involved in the accident for a reason permitted by this subsection, the passenger must return with the vehicle to the accident scene within a reasonable period of time, unless otherwise instructed by a law enforcement officer. A willful violation of this subsection is a Class H felony if the accident or collision is described in G.S. 20‑166(a). A willful violation of this subsection is a Class 1 misdemeanor if the accident or collision is a reportable accident described in G.S. 20‑166(c). (d) Any person who violates any provisions of this section shall be guilty of an infraction and punished in accordance with G.S. 20‑176. Violation of this section shall not constitute negligence per se. (e) An employer who knowingly allows, requires, permits, or otherwise authorizes a driver of a commercial motor vehicle to violate this section shall be guilty of an infraction. Such employer will also be subject to a civil penalty. At Semirog Law we handle personal injury and auto accident cases every day. We have assisted North and South Carolinians, just like you, in reaching successful resolutions to their insurance claims.